Long a Western Canada nightclub and special events favorite, Cease & Desist (formerly Paradox) adopted their name from a court order received from a recording act also working under the banner PARADOX….hence the change in names. 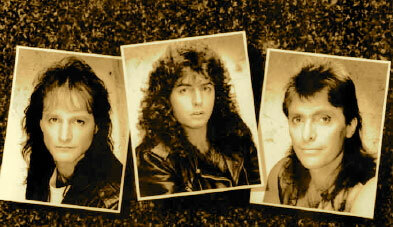 CEASE & DESIST banded together in 1989 and collectively, they possess one of the most extensive and impressive musical backgrounds in the Canadian music industry. On the live stage, they’ve shared the spotlight with the likes of David Foster, Randy Bachman, Colin James, Burton Cummings, Patricia Conroy, Streetheart, Loverboy, The Tragically Hip, Kansas, McLean & McLean, Three Dog Night, David Lee Roth, Alabama, Michelle Wright and the list goes on and on….. Television appearances include video projects for MuchMusic, CBC, CTV,YTV,UTV and CHEKTV. Cease & Desist! Are sure to make your party a great one. They present themselves as the consummate professionals that they are and are always happy to do your special requests. Most jobs they have done in the past have rewarded them with return engagements. The "Kinsmen Club of Canada" routinely uses Cease & Desist as do "Alcoholics Anonymous of Canada" Cease & Desist were flown to Toronto with the "Investors Group" for the eastern leg of their companies’ tour, because s the said, "Cease & Desist" is the best entertainment we have found for our companies "special events"! The band played a three night stand for the "Investors Group" for the western leg of their tour initially, and the company did not want to chance a lesser entertainment package in the east! Cease & Desist has played the highly prestigious "New Years at the Chateau Whistler Ballroom"! Having expanded their horizons to the international market, the band has been asked to perform in Asia and Finland as well! The bands song list is extensive. They take great pride in their versatility. To hear them play an "Andrews Sisters" song to a "Garth Brooks" song to a "Joni Mitchell" song to an "AC/DC" song back to back, verbatim, (if that’s what the request is) is not uncommon and highly entertaining. Be good to yourself! Let Cease & Desist be the band for your next party! Noteable Entertainment & Events is a Vancouver based booking agency, party rental, entertainment services and event production company. If you are interested in booking Cease & Desist please contact us.